OM grown dancers is a non-profit organization and is solely based off of community funding, grants and donations. In the 2 short years of the company's establishment, the OM grown dancers have successfully sold out both of their evening length world premiers in 2017 and 2018, engaged in festivals across North American and travelled internationally to the Dominican Republic and Puerto Rico! The OM grown dancers have continued their evolution and gained tremendous momentum! This upcoming season will be filled with 3 world premiers, international debuts with a hopeful tour to Mexico! The OM grown dancers management and company members are working tirelessly preparing for the upcoming season 3 production: 6 Forms of Fear. Founder and Artistic Director Courtney OM could have only dreamt of the momentum that the company is ferociously building. With consistent rehearsal weekends and countless conversations strategizing about the future, it is clear that OM grown dancers will continue their success, catapulting their captivating movement and productions into the future. The persistency and consistency of the company is tenacious and uncommon! The company is currently set to premier their new work 6 Forms of Fear this May 10th, 11th and 12th, 2019. This is the second of a trilogy about metabolizing fear. As seen last February, Alkhawf (meaning fear in Arabic), dancers acknowledged their fears and pulled the audience into their psyche, using physical movements, complex partner work, elaborate props and live projection; a multi disciplinary production. The new sequel draws audiences into the vulnerable conversations the dancers experience as they sit face to face with their fears. 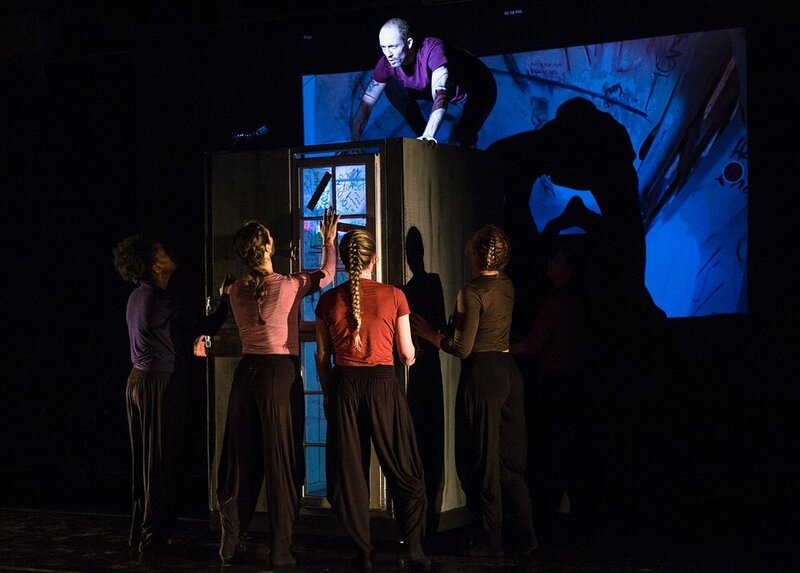 With a set constructed as a living room, expanding on the concept of 'the box,' witnesses will feel deeply connected to the dancers process, serving as the 4th wall of their experience. 6 Forms of Fear is being created on a relatable and powerful scale, it is with hopes that it will capture the attention as Alkhawf did in 2018. As a pair and work in progress, they will be presented together to larger scale production companies and presenters. The full trilogy is set to premier in 2020. With the large scale of this production and performance components, there is a hefty cost that unfortunately follows. The company is seeking financial supports to aid in the execution of the overall vision. With your support, we will be able to successfully produce our work as well as sharing our voices, artistry and fears with our community. Theater: 7 days in the theater with 3 shows at The Durham Fruit. Production: Stage Managers, Lighting Designers & Sound Engineers. Costumes: Original designs and construction for the production. Props: Specifically build and designed for the production. The funds raised would continue to ground my new work in North Carolina and allow me to invest in relationships within the Durham community that would outlast the fundraising’s revenue flow. OM grown dancers and Durham are both on the up and up, but this fundraiser could determine whether they grow together! Though I love that my choreography has elicited that support, I see potential for projects that are larger than what I can independently fund. At this point in my career, I have the expertise and momentum to execute my artistic vision. With every performance, my company grows as a choreographic landscape. This is the first time I have had unfettered access to a group of educated, eager dancers to execute my vision. Our performances resonate with audiences--this is proven by the overwhelming support we’ve received from the Raleigh/Durham community in fully funding our first company debut! Your support will ultimately help enrich the Durham arts community and the possibilities for OM grown dancers to continue our creative journey and travels. The company is excited about the possibility of traveling internationally on a greater scale. The caliber of my work is continually on the climb and there are no intentions of stopping anytime soon! Myself and my OMIES are grateful and extremely thankful that you have taken the time to ready this story. We hope you will consider contributing to our vision and providing greater possibilities for this art to be seen.